Wondering how to make your hair less greasy? Well, the first question is, do you wash your hair every day? I do. Not because I have nothing better to do with my time, but because I look like a greasy, disgusting mess if I go more than 24 hours without scrubbing my hair. And that’s fine. I’m used to it. But every once in a while, I simply can’t be bothered to drag myself out of bed at 6 am to shampoo, condition, blow-dry, and style my hair. Are you with me here??! The only trouble is, it isn’t until I’m frantically drowning my scalp in an entire can of dry shampoo that I remember I simply cannot pull off dirty hair, and when I catch a glimpse of myself in the mirror at the end of the day, I always vow I will never, ever, leave the house without washing my hair again. But after some of my Facebook fans admitted they’ve gone more than a week without shampooing their hair, I decided it was time to get on the internet and figure out how to prolong a hair wash so I can free up some time to do more important things. 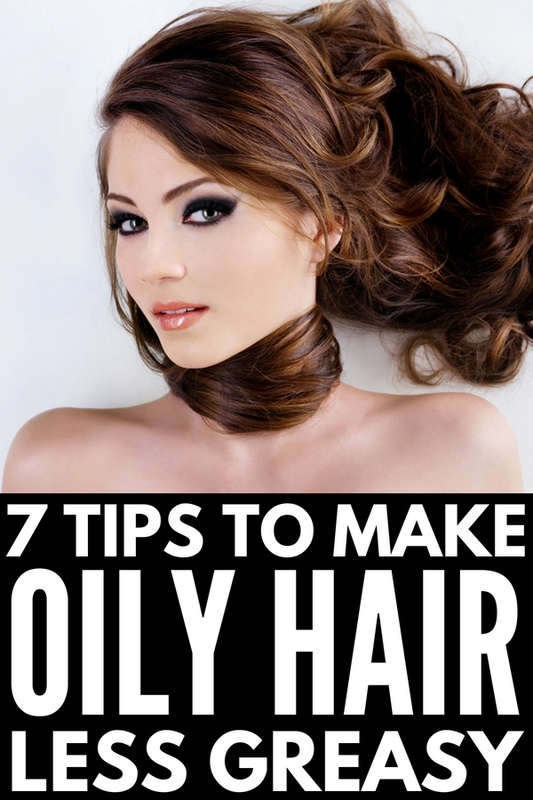 And since I try not to be selfish when I find new and exciting ways to make my life easier, I’m sharing 7 easy tricks to help you prolong a hair wash and still look amazing. If you’re wondering how to keep your hair from getting oily, or how to get rid of greasy hear without washing it…it IS possible, it’s all about learning the proper technique. Have you ever noticed that your hair always looks healthier, shinier, and cleaner after a visit to your hair salon than it does when you wash it yourself? For years, I figured this was simply because stylists use shampoos and conditioners that cost more than our monthly mortgage payment, but after consulting with my stylist about how to wash your hair the RIGHT way, I realized how many mistakes I’ve been making. Like applying conditioner to my ENTIRE head, rather than just to the ends of my hair. How did I not know that was a bad idea? It turns out the way you wash your hair could be causing oily buildup. Using hot water instead of warm can damage your hair. Even if you only shampoo once a week, you should only be using a dime-sized amount (no need to repeat shampoo, either. One round is plenty). My hair stylist has been telling me to stop washing my hair every day for YEARS, but it wasn’t until I became a mom and started researching grease-free hair tips to help cut down on my morning routine that I truly understood how damaging frequent hair washing can be. Not only does it strip hair of nutrients and natural oils, but it can also lead to horrible things like hair breakage, brittle strands, dullness, and dry scalp. I have a tendency of over-using hair products. I just always assume that if a pea-sized amount of straightening balm is supposed to keep my hair straight for the entire day, an apple-sized amount will keep it straight for an entire week. If you’re wondering how to make your hair less greasy, products are the main culprit of dirty hair. Products can contribute to unwanted greasiness, build up, and sticky patches. So if you’re trying to prolong a hair wash, or wondering how to avoid greasy hair without washing, do yourself a favor and avoid greasy hair serums altogether. Be careful not to apply straightening balms, volumizing mousses, and curl-defining sprays too close to your scalp. Only applying products to the ends of your hair will help. Work the product through your hair thoroughly and use a tiny amount of product to start. AVOID GREASY HAIR BY KEEPING YOUR HANDS OFF! But here’s the thing: the more you touch or brush your hair, the greasier it will become. Less touching will help in the fight to make your hair less greasy. Oils in your hair move away from the scalp and toward the ends. If you play with your hair often, you’re shifting those oils faster and faster away from your scalp, which will, in turn, produce more oil to compensate. Additionally, touching your hair can lead to breakouts along your hairline—oils and products transfer to your hands and onto your skin, clogging pores. So, keep your hands to yourself (and out of your hair)! I never thought something as simple as a plastic hat could change my life so dramatically, but after visiting my local beauty store and purchasing a proper shower cap (the ones you get in hotel rooms are useless), I am a completely different woman. Not only does it keep my hair dry while I’m showering on no-shampoo days, but it also prevents it from retaining any unwanted moisture, which always makes my hair look limp and gross. I have one that’s kind of like this Betty Dain one, and it works fabulously! If you plan on skipping shampooing and cutting back on washing your hair every day a shower cap will be your new best friend. Invest in a decent one, because it’s well worth it to keep your hair looking fantastic. You’ve heard of dry shampoo, right? Dry shampoo is the best way to get rid of greasy hair without washing it. It’s an awesome way to refresh hair between washes, and it also adds texture to your hair, so it will hold a curl. Dry shampoo works with alcohol, starch or powder, which absorbs the oil in your hair. It definitely leaves a texture or residue, but hair feels dryer and looks fluffier. You can get a similar effect with cornstarch or baby powder (if you’re looking for a natural home remedy for oily hair) but it’s tough to get it to work through your hair evenly and it can make dark hair look powdery and dull. Spray dry shampoo works well because there are formulas for dark and light hair. Plus, the spray helps evenly distribute the dry shampoo throughout your whole head—a key factor in making your hair look less oily. I prefer Oscar Blandi Pronto Dry Shampoo, but I’ve had luck with several others, like Batiste, amika, and Living Proof. Once I’ve applied dry shampoo to my locks, I like to spray a small amount of water to my hairline and then blow dry my hair away from my face with a round brush. This process only takes a couple of minutes but goes a long way in giving my hair that “just styled” look I love. Using the blow dryer will add extra volume and combat limp and lifeless greasy hair. It also helps the dry shampoo to disperse throughout your hair more evenly, so it can work the oil-absorbing magic. These extra few minutes with the blow dryer still take way less time than showering and shampooing my hair, drying, and styling like normal. So, if you’re looking for a way to skip shampoo and get out the door, hit your hair with a little heat. Unless you have perfect, pin-straight or curly hair, skipping a hair wash doesn’t give you a free-pass when it comes to styling your hair. It drives me bonkers when I see someone sporting day-old hair that still has the imprints of the previous nights’ sleep all over it, especially since you only have to invest about half the time you usually do to get the look you know and love. So plug in that flat and/or curling iron and give your look a little touch-up before you leave the house. Taking time to style your hair will still be way less effort than washing and drying, but it will make a huge difference. Sometimes you simply need to fix the kinks with your straightening iron or sweep everything up into a cute, polished updo. This little bit of effort will make you feel pulled together and ready to go, even without shampooing! If you found these tips for prolonging a hair wash helpful, please share them on Pinterest! And if you’re looking for more helpful tips and tricks to make your hair look amazing, please follow our Hair board where we share all kinds of inspiration!